I need to get this off my chest first because I get giddy just thinking about it! I spent the weekend in glorious Goa where my boyfriend popped the question! Naturally I said yes but the shock has made me forget what transpired and who said what! Maybe it’ll come back to me one day! It just feels so weird to be engaged! I’m still a bit dazed, happy and excited all at once! I’m also feeling a bit overwhelmed just thinking about all the wedding planning that has to be done. Any words of wisdom from you guys would be appreciated! Also, I’m on Snapchat now! I mean I always lurking on Snapchat watching stories but now I’m participating and sharing pointless selfies and beauty bits as well. Username is blushcanvas. Also please leave your usernames below if you do use it, I’d love to follow your stories! Let’s get back to business! 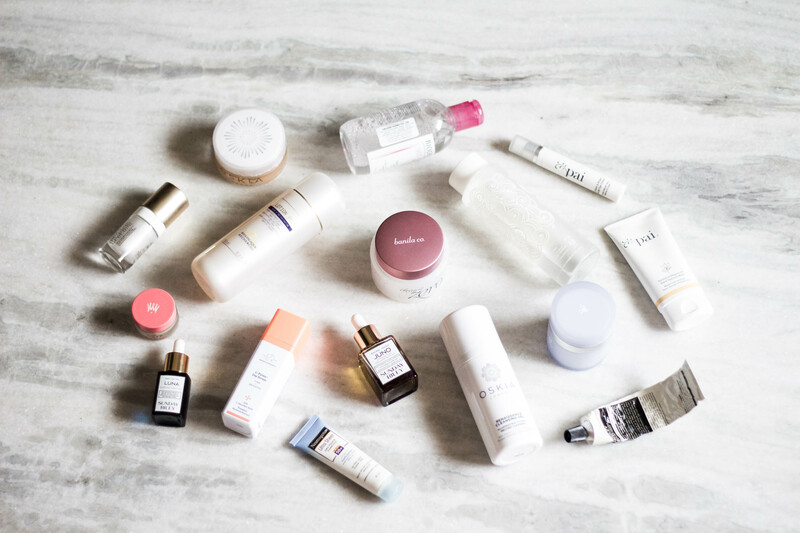 You might get the impression that this skincare routine is a bit excessive. You’re right! I’m currently using a lot more products than I normally would. I just ended up buying a few things that I’d always wanted to try and I’m currently in between ‘this is working well’ and ‘I’m still experimenting’ states. Some of these products are absolute gems and the rest need more time to prove themselves. You’ll need to settle down, it’s going to be a long post! 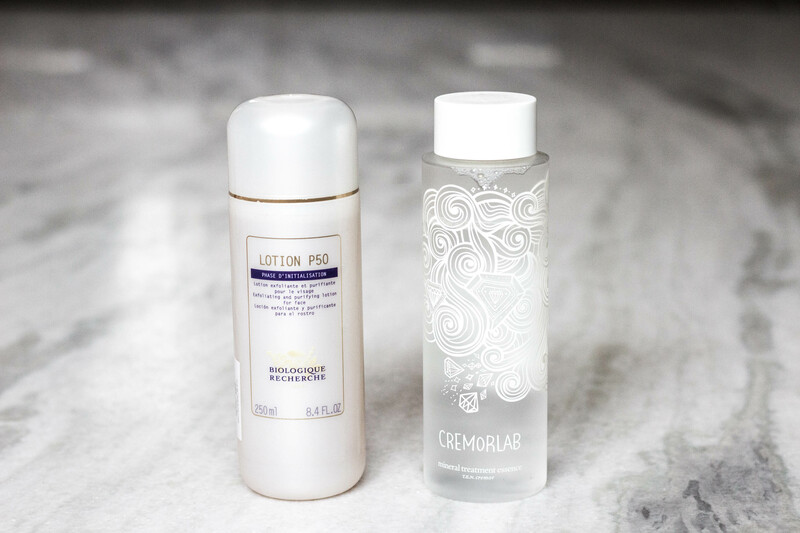 I didn’t want to do separate AM/PM routines because I use a lot of the same products. I will mention very clearly how and when I use certain products though. I should probably start off by telling you more about my skin. If you’ve read this before, feel free to skip ahead! So in general, I have dry skin but I have more normal skin when it’s humid here. So my focus is always on hydration! Apart from that I tend to get spots on my chin, usually hormonal but still recurring. To a large extent this has reduced ever since I’ve incorporated acid toning in my routine. A new concern for me is also reducing some of the hyperpigmentation and sun spots on my face. There you’re all caught up! 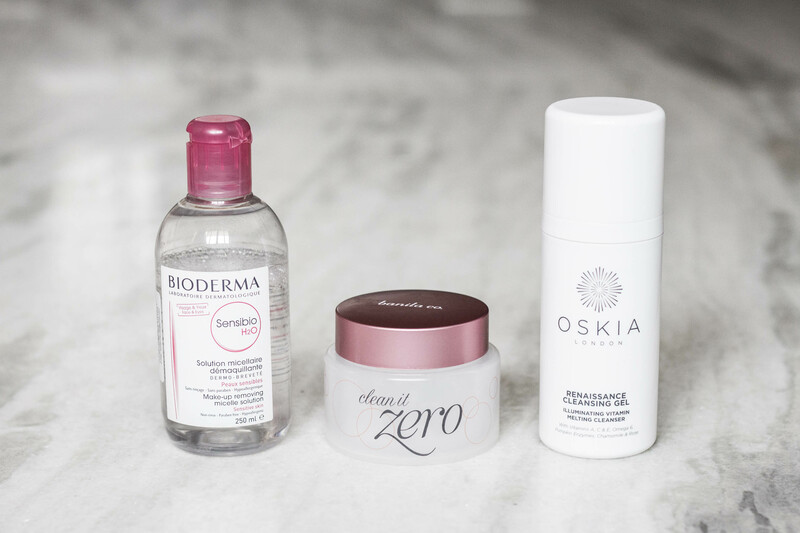 Let’s start with cleansers! I’ve been using this for years ever since it launched in India. I can never go back to those makeup removers that leave an oily residue now! Every night I use this to take off my eye and lip makeup. This takes off the majority of it so I don’t end up with a swirl of mascara and lipstick in the next step. It’s very gentle on the eyes and you can really work it into your lashline to remove makeup, I’ve never had any sensitivity issues with it. I already have a backup. I’m so glad I tried this! I’ve been very loyal to cleansing oils thus far and this is the first cleansing balm I’ve tried! I looks almost like a whipped sorbet, it has that kind of light texture. You only need a little dollop and it instantly turns to oil on your face and melts away makeup, even the most stubborn kind with ease. It’s also extremely gentle on the eyes and never stings. I’m so impressed with this! I believe it’s a Korean brand but you can get this on a bunch of websites. It’s also very affordable at $18! I have all links and prices for all products at the end as usual. The only slight issue I have with this is that the container always has a bit of oil around it. Maybe because I’m in a warmer climate but I don’t like that oily feeling every time I try to open the tub. I’ll be using a cleansing oil next because I’ve already purchased it but I would buy this again! There are two other variants of the Clean It Zero, I might look into those! The cult favourite! I haven’t completely bought into the hype though. I’ll start with the good. It’s an orange gel that turns into an oil and emulsifies when it comes in contact with water. I really prefer using this as a cleanser in the morning and as a second cleanser at night. It’s great at giving you that fresh zesty feeling, owing to the scent and pumpkin enzyme. It keeps my skin very hydrated and it never feels stripped. But I cannot believe people take off their entire makeup with just this! Firstly, it does a decent job but does not take off every last trace like a proper cleansing oil/balm. Secondly, this really stings my eyes which is reallu unfortunate! I would potentially repurchase this to use as a second cleanser but I also want to try the Glossier Milky Jelly Cleanser first. Onto the toners! It’s an acid toner, meaning it has a low PH and this one contains a bunch of AHAs (like lactic acid), PHAs and niacinamide. I use this every night after cleansing except on certain days when I’m using my Good Genes because that is a strong lactic acid treatment. For the majority of last year I was using Lotion P50V, a variant of P50 meant for sensitive skin and it just changed my skin for the better. Overall, the texture of my skin was less dry, I didn’t get dry patches as often and my acne (barring hormonal) was well under control. I’m happy to say that P50 has pretty much picked up where the previous one left off and continued it’s magic. It doesn’t always sting, usually only in areas where I have dryness but it’s not unbearable. I use 4-5 drops on a cotton pad and pat this all over my face. I will say that P50 smells a lot nicer than P50V and I think this will be the one I continue to purchase henceforth. This is the first essence I’ve ever used and it’s great at instantly hydrating the skin, it feels very cool and refreshing. It calms my skin down after the exfoliating stage or after any mask I use. I also like using this just by itself at times when I quickly want some moisture but I’m not ready to do the full skincare routine. I suppose it fills the void of wanting a hydrating serum or facial mist. This bottle is 250ml and I think it’ll last me for rest of the year as I only need 4-5 drops to cover my face. Cremorlab is again, a Korean brand and slightly more tricky to get hold off. I do like this a lot but I don’t think it’s an essential. I won’t be repurchasing this and I might just go for a good hydrating serum in the future instead. Speaking of serums, that’s the next lot! After trying the very effective OST C20, I knew that a Vitamin C serum had to be a permanent feature in my routine. After reading a lot of reviews, I settled on this one from Drunk Elephant. I had never heard of the brand before but it has stellar reviews on Beautypedia (five stars!) and I also relied on a couple of Sephora reviews. I had a bunch of old acne scars and hyperpigmentation that this has helped fade. Compared to other Vitamin C serums (that also oxidize in 3 months), I feel this shows results slowly but the serum is a lot more stable and will last longer. It’s expensive at $80 but I won’t have to throw it away after a few months. This one miraculously has a shelf life of 24 months! Vitamin C (L-ascorbic acid) is an ingredient that sinks into your skin and can’t be washed off for 72 hours, it’s also effective at very low PH levels so I would recommend just testing it out first. I tend to use this everyday but sometimes I stray off my routine and use this every other day. Some people complain that this can be sticky and look too shiny. That does happens if you use too much. I usually go for one pump for my face and another pump for my neck. I don’t do both pumps at once because you do end up with more product on the face that way. Hope that made sense! With the right amount, this does give a bit of a glow and hydration to your skin. I also use SPF whenever I have this on. I bought the Exclusive Duo from Sephora which has 15ml versions of Good Genes and Luna for $78! I wanted to try both products and this is the best way to do that. I’ll also say that if you do use both products this might be the better way to buy them because 15ml also lasts a very long time, you don’t need to use these products everyday and you will get a more fresh batch of products as you repurchase. But anyway, more on Good Genes. It’s a lactic acid treatment that comes in a pump packaging (yay), it’s a soft creamy texture that sinks in very easily and smells like lemon pickle! It’s a very strong scent and I can see why it can be off putting to some. For now I use it just once a week and it really helps keep my skin texture soft and problem free in general. I haven’t noticed miraculously different results but I feel that’s also because I have a good routine in place otherwise. I’m still making up my mind if I need this, I’ve been using this for barely two months now. I introduced Luna a bit earlier in my routine and I found it really helpful. It’s a blue tinted (by dye, not blue tansy as advertised) oil that turns more clear as you massage it in. I had never used a retinol product before and initially I did use this every other day. I also went through a purging period for around 3-4 days when all these tiny bumps showed up and disappeared the next day, it also cleared out acne on my chin in the process. Since then I use this twice a week. At that time of the month I use it more frequently and concentrate it on just the areas where I have spots. This can also be used as a targeted treatment! Unlike Good Genes I do notice clearer, more radiant skin the morning after. I’m more inclined to use this again but I am wary of the dye used in this. 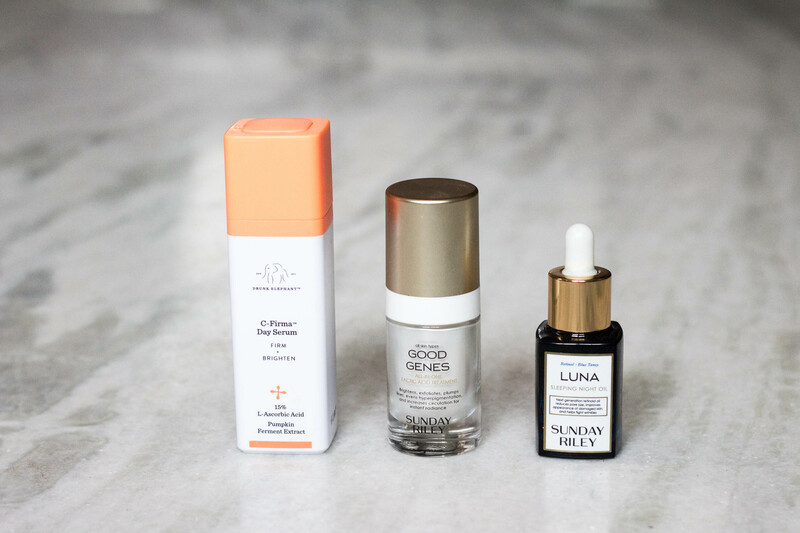 About using AHAs and retinol at the same time, Sunday Riley do mention that you can use Good Genes first, wait for 5-10 minutes and then apply Luna. I follow the same time frame and apply this 5-10 minutes after acid toning. Also, if you are using a Vitamin C serum along with AHAs and retinol in your routine, only use Vit C in the mornings. There’s some conflicting research but overall the safer route is to not mix them. I’ve been using this for around six months now and I love it! 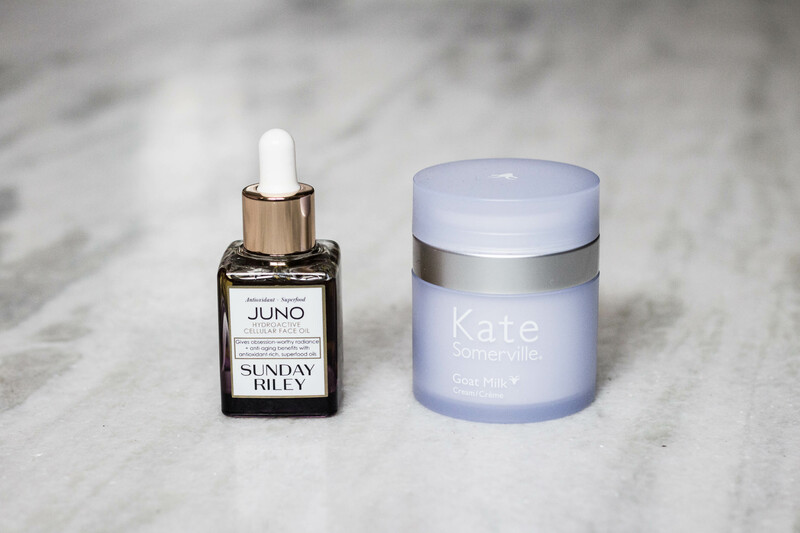 I was looking at all the Sunday Riley oils and Juno really appealed to be because it’s lightweight, hydrating, packed with antioxidants and has a (comparatively) mild herbal scent. You can actually use this in the day time if you have really dry skin but I only use it at night. 2-3 drops is all it takes and I wake up with soft and hydrated skin in the morning. But considering how much this costs, I’m not so sure I’ll repurchase this anytime soon. There are a lot of facial oils out there that do the same job and this might be a nice item to splurge on once in a while but, it’s not holy grail for me. This is going to last me ages though so expect to see this on the blog a lot more often! Again, another splurge purchase I made when I was at Sephora! I love this cream though, it’s lightweight, smells a bit milky and is moisturising throughout the day. It may not be rich enough if you have very dry skin but you’d find this comfortable if you have dry or normal-combination skin. I love the packaging though! The surface is a pump with a tiny hole in the middle where the product comes out. The mechanism is working very well for now but I’m curious to know how it’ll fare when there’s very little product. Again, it’s a product where I don’t feel like I’ve wasted my money but I don’t see this as an absolute essential where I would repurchase this. I don’t really expect much from eye creams. I want them to keep the area around my eye hydrated and not sting if I get the product too close. This does just that and I love that it comes in a pump. I usually only need half a pump for both eyes and this has lasted me for a long time! I would definitely get this again! I’ve remained loyal to this for years now! To be honest, I didn’t use it every single morning unless I knew I was going to be out in the sun for longer than a couple of minutes. Now that I’m using a Vitamin C serum, I do use this everyday after it. It sits well over the serum and has a matte finish. Doesn’t disturb any makeup and everything applies just the same as it would otherwise (for better or for worse). I also don’t mind the floral scent. I always buy smaller tubes of this because I don’t need a lot and sunscreens break down quickly. I like get fresher products every time I buy it and this size is easy to slip into my handbag. 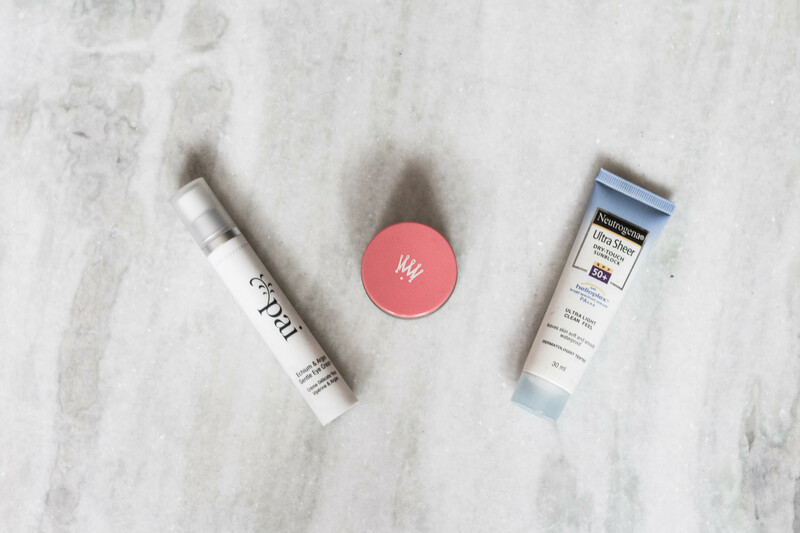 I’ve already talked this lip balm many times and it’s forever on my repurchase list! I’m currently using one that came with limited edition packaging, love that red cap! It’s a thick balm with a demi matte finish which is very strange for a lip balm. I apply a very small layer in the morning so my lipstick doesn’t slip around too much; at night I apply a thicker layer. It’s also very repairing and soothing if you have chapped lips or irritation. I have a love hate relationship with this mask. I love that it doesn’t leave me skin completely stripped, it does a great job of cleaning up my pores and leaving my skin feeling super clean! I hate that this has alcohol and lavender added to it, I don’t know if it’s very irritating but I sometimes find the smell to eb too strong! Also, The tube might be very photogenic and blogger-trendy but it keeps flopping around and falling over! So I’m not repurchasing this just yet but it’s still one of the best clay masks I’ve used. 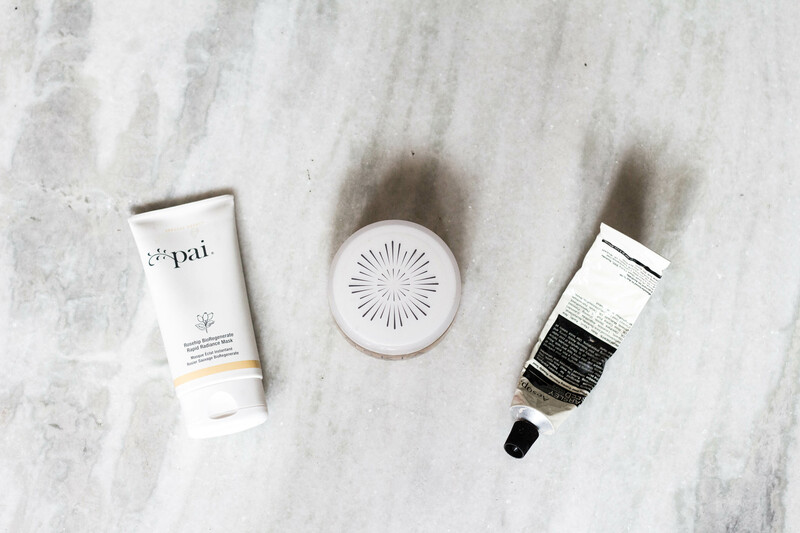 I usually use the Pai mask after this followed by the Juno oil. I didn’t really intend on buying this mask but it came with a set that contained the Pai Rosehip Oil, which is what I actually wanted. But I’ve grown to like this! It’s a mango coloured creamy mask and it leaves your skin feeling very plumped! I don’t really get brightening effect the way I do with the Oskia Renaissance Mask but it’s a nice 2-in-1 kind of mask. So I initially bought this to replace my holy grail Dermalogica Gentle Cream Exfoliant and while this doesn’t really compare in the exfoliation department, the glow this gives is so worth it! It’s a very expensive mask but luckily you don’t need a ton for each use. The texture is a rather odd translucent gel like formula which turns more white and opaque as your massage it on your face. After 15-20 mins and a slight warm feeling, my skin looks so radiant and smooth! I use this once a week, usually reserved for weekends because I like using this before I’m going out for dinner or something like that! With Good Genes in my routine, I don’t miss a stronger exfoliating mask and this is great for a quick pick me up! I would like to buy this again but the price hurts! I’ll probably wait for a good sale and then grab it! So there’s my skincare routine! A total of 16 products that I want to cut down to 10 in the coming months. I’ll probably do detailed reviews with more information about the ingredients on some of these products over the next few months. Let me know what you’d like to hear more about. What’s your skincare routine like?